Muhammad Ali, arguably the most famous professional boxer in the 20th Century and the only fighter to win the heavyweight championship three times, was born Cassius Clay in 1942 in Louisville, Kentucky, to Cassius Marcellus Clay, Sr. and Odessa Grady Clay. At the age of 12 Clay began training as a boxer. During his teen years he won several Golden Gloves titles and other amateur titles. At the age of 18 he won a gold medal in the 1960 Summer Olympics in Rome, Italy and then turned professional. In one of the most famous boxing matches of the century, Clay in 1965 stunned the world by beating apparently invincible world heavyweight champion Sonny Liston in six rounds. After defeating Liston, Clay announced his conversion to Islam and joining of the Nation of Islam (NOI) under the leadership of Elijah Muhammad. Clay also announced he changed his name to Muhammad Ali. As a member of the NOI, Ali was mentored early on by the organization’s most charismatic leader, Malcolm X. In 1967, at the height of the Vietnam War, Ali received his induction notice. Instead of dodging the draft, Ali announced publicly that he refused induction. Government officials shortly thereafter tried, convicted, and sentenced the boxing champion to five years in prison for draft evasion, but he remained free pending appeals. However, United States boxing officials stripped him of his boxing title and suspended his license. During his suspension, Ali became an activist, touring the country, speaking to civil rights organizations and antiwar groups. In early 1978 Ali lost his title to Leon Spinks, but regained it in a rematch with Spinks later that same year, becoming the first boxer to win the championship three times. Ali retired with the title but returned to the ring in 1980 to face the new champion, Larry Holmes. Ali was unsuccessful and retired permanently in 1981. Ali retired from professional boxing with an overall professional record of 56-5. Over the course of his 61 fights, Muhammad Ali introduced boxing to audiences around the world. Althought the majority of his engagements were in the United States, he fought in matches in Bahamas, Germany, Philippines, Malaysia, Zaire, Indonesia, Ireland, Canada, Japan, Switzerland and Great Britain. He successfully defended his title before a mostly international audience in San Juan, Puerto Rico in 1976. 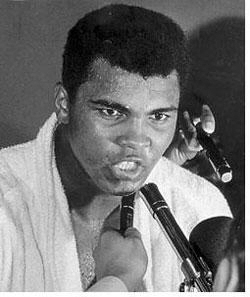 By the end of his career Ali was the most well-known athlete in the world. In the early 1980s Muhammad Ali was diagnosed with Parkinson’s disease. Nevertheless in 1985 he participated in the negotiations for the release of kidnapped Americans in Lebanon. During his lifetime, Ali has also received numerous honors and awards for his humanitarian work. The Olympic committee selected him to light the Olympic flame for the 1996 games in Atlanta, Georgia. During that event he received a replacement gold medal for the one he received in 1960 that he tossed in the Ohio River in disgust over a racial incident. In 2005 he also received the Presidential Medal of Freedom at the White House. That same year, for his work in the civil rights movement, the former boxer was awarded the prestigious Otto Hahn freedom medal by the German Society for the United Nations. The Muhammad Ali Center opened in his hometown of Louisville in 2005. The facility displays Ali’s boxing memorabilia and showcases themes of civil rights, social responsibility, respect, and personal growth. Ali was married four times and has nine children. The boxer spent the remaining years of his life in Scottsdale, Arizona with his fourth wife, Yolanda “Lonnie” Ali. He died on June 3, 2016 in Scottsdale at the age of 74. David Remmick, King of the World: Muhammad Ali and the Rise of an American Hero (New York: Vintage Books, 1999); Hana Yasmeen Ali, The Soul of a Butterfly: Reflections on Life's Journey (New York: Simon & Schuster, 2004); Kwame A. Appiah and Henry Louis Gates, eds., Africana: The Encyclopedia of the African & African American Experience (New York: Basic Civitas Books, 1999). Experience (New York: Basic Civitas Books, 1999).